Unfortunately my blog posts had a tendency of focusing on my problems with developing my thesis. But now, I am lucky to report on something else. I had a fantastic Sunday, and I would like to share my experiences. This was the 19th Festival of Museums. The organisers each year chose a main theme. This year it was 19/20 – referring to the long 19th century (lasting until the outbreak of the 1st World War). 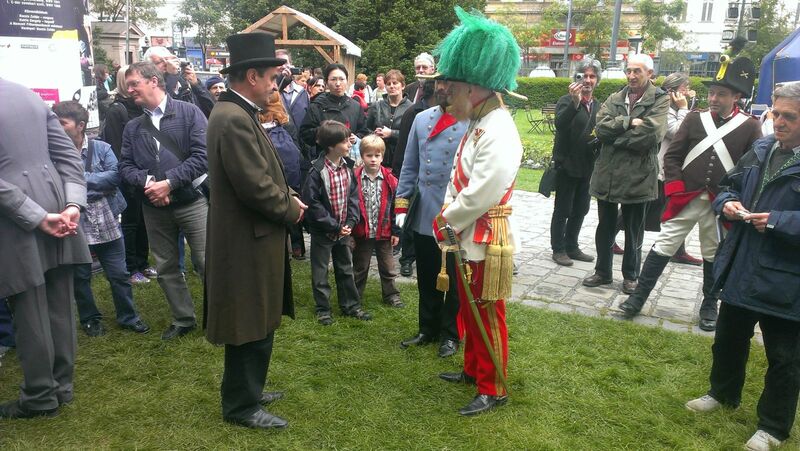 To that end the organisers hired a Franz Joseph I of Austria lookalike. The man, a software engineer from Wales, learnt a bit of Hungarian, so he sounded like the Emperor and acted like an emperor, complete with an entourage. This resulted in increased media attention. There were over 100 museums. The National Museum provided tents, so there was a unified look at the site. The whole event was designed to attract more attention to museums. But as a festival, it attracted a very diverse range of visitors. Families came with children, schoolgroups wandered around, elderly couples mingled with tourists, who had no idea what is going on. Especially when Franz Joseph I took his tour around the premises! Looking around, there were museums which had no problems attracting flocks of visitors. When you represent the Museum of Distaster Management, then you can show fire engines. When you represent the Csepel Local History Collection, you can show Csepel trucks and motorcycles. These may not comply with the 19/20 theme, but will draw the attention of kids and adults alike. In another corner a bunch of civil organisations showed sword-play. Again, it was not related to the 19/20 theme, but it was a crowd-pleaser nonetheless. However there were a few museums, which really rose to the challenge and I am very proud to say, that the Postal Museum was one of them. Back in 1896 at the Millenium Exhibition in Budapest the Telefonhírmondó (Telephone Herald, a telephone-based newspaper) was shown to the Emperor. The Telefonhírmondó was a popular service, broadcasting news, concerts etc. You can read more about that on wikipedia. Visitors were able to listen to Telefonhírmondó broadcast at the tent. Even the Emperor listened in, while a member of the Museum staff, dressed in period costume, showed him around. 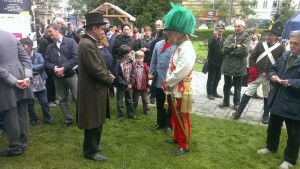 This was a reenactment of the 1896 visit which worked superbly. Other attractions of the Postal Museum tent included a bench, where little kids were able to try their skills with quills. I became a telephone operator. A mini telephone switchboard was installed. I had to plug various cables to connect two people on the phone. Teenagers who never held traditional phone devices were very excited when they heard each other on the phone. A little guy even came back later to try the phone again. This was a very good experience for me.